Our 100% online DOT HAZMAT Function Specific – Shipping Batteries course is for hazmat employees who ship or package batteries on the job. This course meets function-specific training requirements for 49 CFR 172.704(a)(2)(i). Our online DOT HAZMAT Shipping Batteries – Function Specific course is designed for Hazmat employees who are involved in the process of shipping or packaging hazardous batteries. The course includes training on: Battery types; Hazards associated with batteries; Hazard management; Lithium batteries; DOT, IATA, and IMDG shipping requirements; and Incident reporting. See our Detailed Course Outline for more information. This training complements and builds on DOT Hazmat General Awareness training. If you haven’t completed General Awareness training, you may want complete one of the following courses first. Package deals combining the General Awareness training and Shipping Batteries training are available. 10 Hour Advanced DOT Hazmat General Awareness Course, which includes Function Specific training. 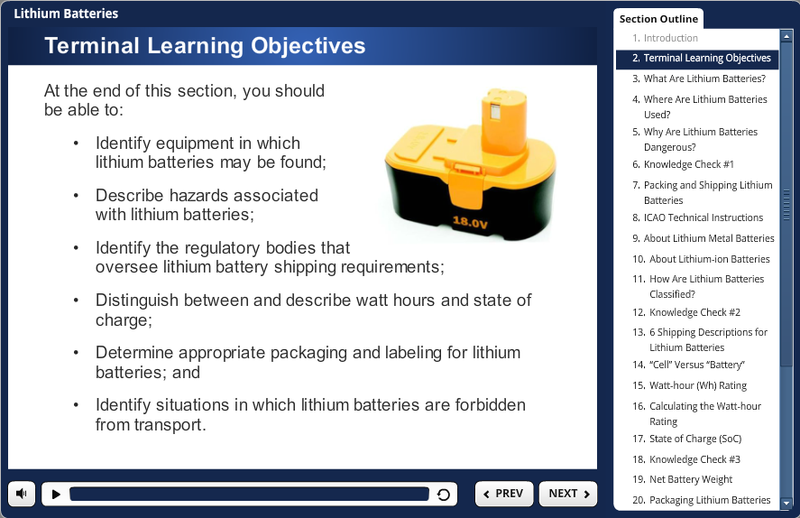 Designed by Certified Outreach Trainers, this DOT HAZMAT Batteries course is provided 100% online and is available 24/7. Taken through our state-of-the-art Online Training System (OTS), you will benefit from high quality, interactive training. The course is fully narrated and self-paced, so you can save your progress and train at your convenience. We also include a downloadable / printable student manual as reference material and to assist with note taking. Students may take up to 6 months, if desired, to complete the course after enrollment. To ensure customer satisfaction, we offer a 100% Money Back Guarantee*. The desired course option must be selected at enrollment. 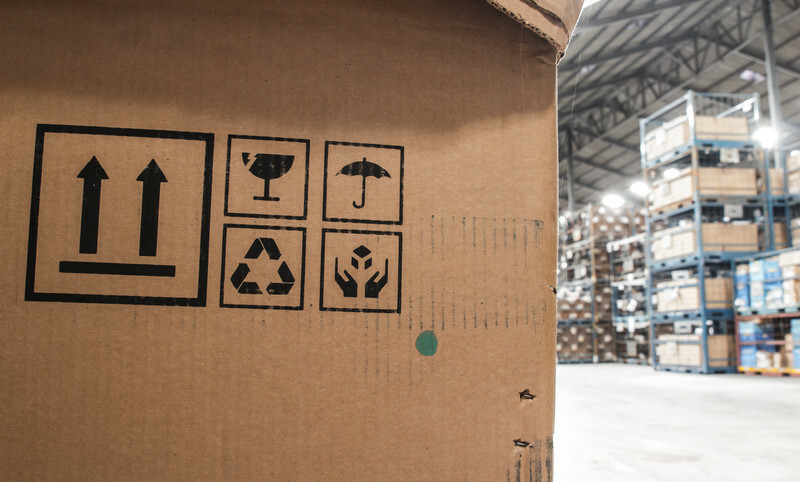 Shipping and transporting batteries | Lithium batteries; wet batteries; non-spillable wet batteries; dry batteries | What makes a battery hazardous? | General battery hazards | Battery malfunctions | Short circuits | Dangerous evolutions of heat | Shipping requirements | Packaging | Exemptions | Packaging batteries of more than nine volts | Hazardous materials regulations | Batteries in the Hazmat Table. 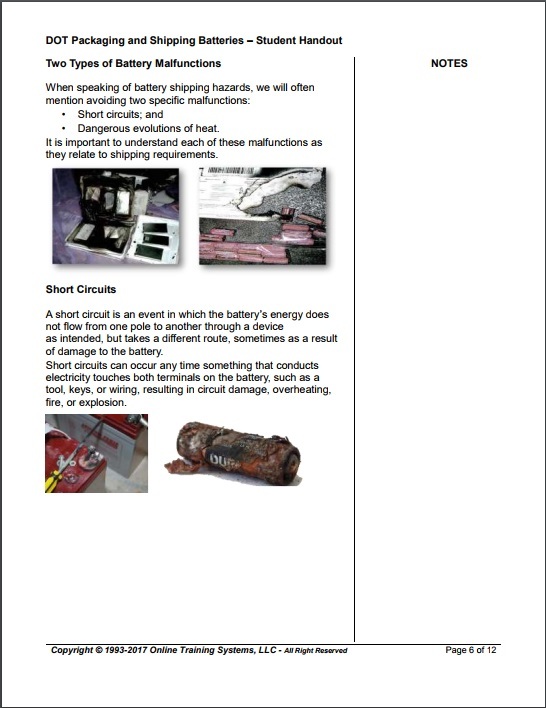 Definition, use and dangers | Packing and shipping | ICAO technical instructions | Lithium metal batteries | Lithium-ion batteries | Classification | Shipping descriptions | Cell vs. battery | Watt-hour (Wh) rating | State of charge (SOC) | Net battery weight | Packaging lithium batteries | Damaged, defective, or recalled batteries | Prohibition and restrictions | Common labels | Traveling with lithium batteries. Reportable battery incidents | How to report an incident | When to file a report | Notifying the National Response Center | Evidence preservation | Reporting discrepancies | Types of discrepancies | Incident statistics. The objective of this DOT HAZMAT Function Specific course is to meet the Federal Department of Transportation (DOT) training requirements for 49 CFR 172.704(a)(2)(i). Respond to incidents with batteries. This DOT HAZMAT online course consists of 5 sections, completed through our Online Training System (OTS). Interactive quizzes help students retain the training material. The final exam for this course includes 10 questions, which are randomly compiled from a large pool of possible questions. A score of 70% or higher is needed to pass the final exam. If a student doesn’t pass, the exam may be retaken as may times as needed in order to pass. This DOT HAZMAT class was designed by Certified Outreach Trainers and meets function-specific requirements for 49 CFR 172.704(a)(2)(i). Upon course completion, your PDF Certificate of Completion will be available to download, save or print. We’ll also mail you a PVC credit card style Wallet ID Card with optional photo, within 24 hours of training course completion. HAZMAT employers are required to train new HAZMAT employees within 90 days of employment or assuming new related job responsibilities. Direct supervision is required of the employee performing a hazardous material function until training is complete. DOT requirements specify HAZMAT employees need to be retrained and tested at least once every three years. Please note that this this HAZMAT Shipping course is not meant to replace company-specific or function-specific training provided by your employer on equipment use and procedures for your particular work environment. You must be trained by your employer on the hazards, equipment, engineering and administrative controls, safe work practices and emergency plans specific to your role and workplace. Employers need to evaluate employee needs for additional DOT hazardous material training and training in the use of personal protective equipment used on the job.